I love to try new recipes, but I have a problem- I have so many saved, pinned, and printed, I sometimes have a hard time narrowing down what to make! Having a theme makes it so much easier for me to decide. 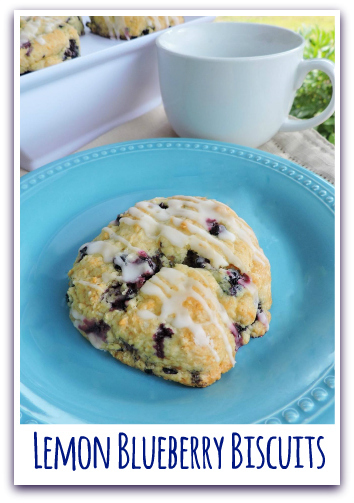 This month, I'm joining the #BakingBloggers, and we're sharing biscuit and scones recipes. Poring over my mountain of choices, I thought about what flavors I'm loving right now, and what I have on hand. We moved 4 blueberry bushes from my parent's property to ours this spring, and while it was a slow year for them, there's been a good amount. I ended up choosing these Lemon Blueberry Biscuits from Taste of Home. I had all the ingredients on hand. The only change I made was using Greek yogurt, and I only had a 5.3oz container, so I made up the volume difference with some sour cream. I used a cookie scoop to portion, and next time I'd probably not. It made them a little more smooth-topped and a tiny bit compacted on the interior. These disappeared in a flash. They'd also be great with orange zest/juice. I'm also going to make a version with blackberries, since we have another few weeks worth of those ripening in the yard. Thanks so much to the Test Kitchen for another family favorite recipe! Be sure to check out what other bakers are serving up this month, using the links at the bottom of the post. Big thanks going out to Sue from Palatable Pastime for hosting this month and inviting me to jump in! Preheat oven to 400°. In a large bowl, whisk the first five ingredients. In another bowl, whisk yogurt, egg, melted butter and lemon peel until blended. Add to flour mixture; stir just until moistened. Fold in blueberries. In a small bowl, combine glaze ingredients; stir until smooth. Drizzle over warm biscuits. Yield: 1 dozen. Sound like they would go fast in this household too Jolene. If only we all had time to make every recipe we have stored in our must-make-someday folder! I love that you used sour cream in these too...I have a feeling I'll be doing that more often! Jealous of your blackberries growing in your yard! These look wonderful and sound delicious. I bet they disappeared in a flash! They are soooo pretty, and lemon and blueberry need to get married. 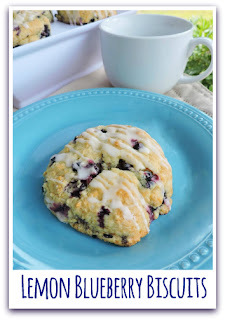 I love how much less-fat this recipe is- I am on a scone kick now, so I have to try this! I love lemon and blueberry together and these sound great - like the idea of yogurt in there. I would love these for breakfast any day of the week! Thanks for baking with us.